Paul Ryan accused China of trying to “upend” the international economic order during a speech on Wednesday. A Republican presidential hopeful blasted China during a speech at prominent national security think tank in Washington, D.C. on Wednesday. Speaking at the Center for a New American Security’s (CNAS) annual conference, Rep. Paul Ryan (R-Wis.) called out China on everything from its economic policies to its efforts to disrupt the international order. Not surprisingly, given his focus on the economy and budget as chairman of the House Budget Committee, Ryan’s harshest criticism was reserved for China’s economic policies. While saying that he could “think of no better testament to the potential of free enterprise” than China’s reform and opening up over the last three decades, Ryan accused China of trying to “upend” the liberal economic order. “But with its new power, China isn’t trying to bend the rules—it’s trying to rewrite them altogether. It’s stealing our intellectual property. It’s attacking our companies. It’s promoting crony capitalism. In a narrow-minded pursuit of its narrow self-interest, China isn’t trying to uphold market principles but to upend them,” Ryan said according to a transcript of his prepared remarks. Ryan said to counter this, the U.S. must convince China that “it doesn’t pay to break the rules” and that a free market economy would benefit China just as it benefits America. Furthermore, Ryan said that the U.S. should help China’s neighbors stand up to Beijing economically through policies like the Trans-Pacific Partnership. 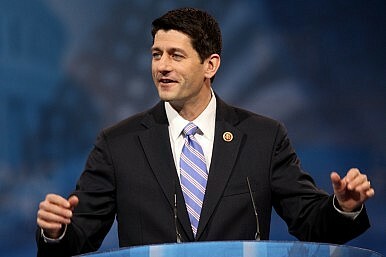 In doing so, Ryan said that China could be pulled into the liberal economic order. Ryan, whose best known nationally as the running mate of Republican presidential candidate Mitt Romney during the 2012 election, recently visited South Korea, Japan and China as part of a Congressional delegation that was in the region at the same time as President Barack Obama. The conclusions he drew from this trip led him to levy indirect criticisms against China on security matters in the speech. “And there’s another area that demands our attention,” Ryan said at one point during the speech, “and that’s Asia.” He said that in his conversations with allied leaders during the trip, it became clear that they are skeptical of America’s commitment to the region. There is are real dangers associated with this uncertainty, according to Ryan. For example, he alleged that because of America’s lack of credibility, Japan and South Korea “harbor” ambitions of potentially pursuing nuclear weapons. Elsewhere in the speech, Ryan included China, along with Russia and “a gang of rogue states,” as countries that continue to try and disrupt the international political order. Ryan is widely believed to be considering a run for the presidency in the U.S. election. The decision to give a foreign and security speech at CNAS on Wednesday was part of an effort to convince Washington and the American public that his interests and expertise go beyond the economic and budgetary matters that he has focused on in Congress. The overarching theme of his speech was that America needed to pursue a strategy of “renewal” that consisted of three pillars: renewing alliances, renewing the military and renewing the economy. As is typical of major foreign policy addresses tied to elections, the speech was heavy on promoting American values and principles abroad. “And so America should lead not just because of whom we stand with—but what we stand for: freedom, justice, and the rule of law,” he said. At the same time, likely to assuage Tea Party voters and a war-weary American public, Ryan stressed that the U.S. shouldn’t militarize its foreign policy or be the sole enforcer of international norms. Instead, he said that the U.S. should rely on similarly-minded allies to help uphold the international order and fight terrorism. In this sense at least, Ryan’s vision was indistinguishable from President Obama’s, despite being sharply critical of current U.S. foreign policy. What the next U.S. president needs to consider when shaping a South Asia policy.